Description: “Dostar Alem” Hotel – a new type of a hotel, built in the light of the characteristic features of a modern metropolis. 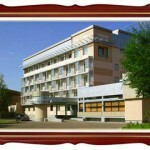 Description: Four star hotel “Cosmonaut” hospitably opens its doors to guests of Karaganda since 1972. The hotel was originally designed for astronauts returning from orbital flights from the Baikonur space center. The heads of state, famous politicians, artists are frequent guests of this hotel. Description: In December 2003 in Karaganda opened first hotel in the region named “Alatau”, which can rightly be called a boutique hotel. Alatau is located in the center of the city, on one of the main streets. Not far from the hotel there are bowling center “Arman”, a water park, a large shopping center.